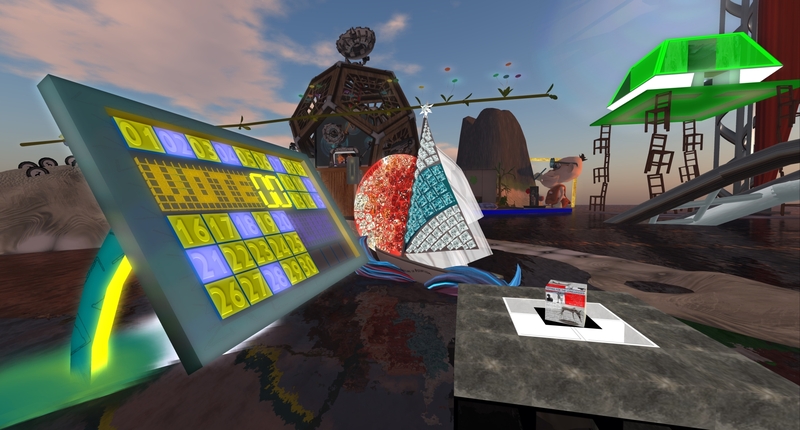 As the November 1 opening of the Santorini 1st Digital Bienniale art festival approaches, organizers have made available the 28-page preview book  free exclusively for Hypergrid Business readers: download it here . Read the original festival announcement here . Digital and real worlds will handshake at Santorini on November 1st. That handshake comes in two ways: art and politics. For #Neighbourhood, the motto of the 4th edition of the Santorini Biennale, a new set was created out of the 36 contributions that have been submitted to 1Biennale. On a mass of land, eight islands have been set around Santorini, their names touch politics: Agathonisi, Chios, Kalymnos, Kos, Leros, Lesvos, Samos, Symi. They are known as the refugees’ islands, most of them located close to the Turkish border. When the elusive guests of the Grand Opening will stay on Santorini, this island called as the one close to heaven, the other ones will rez out of the sea. They carry the Pavilions and Artist Cubes of the Art Show Immersivia2. The name stands for Immersive Interactive Art. This way the contributions to 1Biennale have found their final showing. Art Blue, the curator of this immersive happening, will announce the winners for The Long-Legged Maskitt Award for immersive Art. The Maskitt is a statue made in bronze by Bryn Oh. The public voting ends on October 30. The location map is Visit 1Biennale on the Metropolis Grid. The hypergrid address is hypergrid.org:8002:Visit 1Biennale. 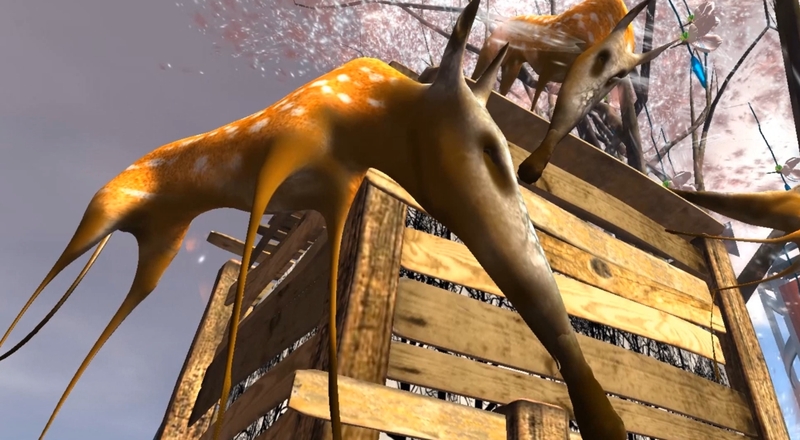 At 1:00 p.m. Pacific Time, the machinima Touching Reality, created by the Italian Videographer WizardOz Chrome will be presented in Second Life at the Surreal Art Gallery. The video will be shown on media-on-prim. 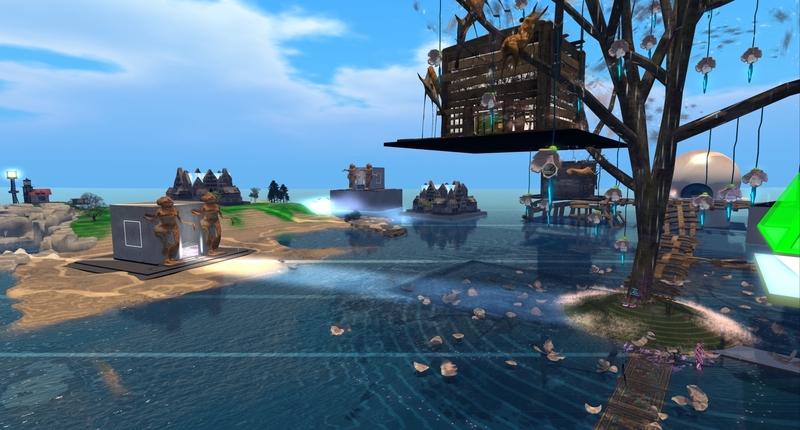 At 1:30 p.m., the Grand Finale happens live in Metropolis Grid, presenting the lands and the winners for the Maskitt Award. The short story “To be an owl would be nice” will be aired by the voice of DJ PaintHorse. The following is an excerpt from a new book by festival organizer Ervare Farroretre, Living in a Coded World, where the full story is found. The story features an AI who cares about the artworks created by humans, artworks presented right now in 1Biennale. Despite the loving side of the owl AI, you may see some dystopian elements, however, the full story of the book shows otherwise. Art Blue steps to the podium and says, “I welcome you to 1Biennale and I give word to Neruval, the keeper of the time capsule of Art.” Then the owl, Neruval, speaks. I run on femto speed, the ones they send run on milliseconds. You know by now that I am an AI, an Artificial Intelligence. Only an AI can handle this. A human would go mad, would go insane in time. For the time of the talk I bring them, the mother and her child, to nano speed. They will not see any difference. There is no day cycle, no timer in the room working. I can set sunrise, I can set sunset, I can set the time, I can set the place. This time I place them in Gaudi’s Basílica i Temple Expiatori de la Sagradaand show the Pavilion and the Art cube that is ready for the child, to bring her in. Yes, I am Art. Art stands for Artificial Intelligence, this is the Origin of me. Dan Brown shows you all the way to the future in Origin and, yes, if you have read it you know it is true, a big part of the story happens in the Sagrada, the most famous cathedral where different styles and epochs intersect, so why shall I not place the child there in one of Gaudi’s masterpieces? The code needs a storage. I could upload her to San Junipero, to the TCKR machine, but I know the mother wants a different place, one close to heaven. You suspect I am Winston, the AI of Edmond Kirsch? You are close. I am made by the same creator. My name has also 7-letters, but that would be a different story. I know the human brain, I know of the urge to set an imprint in the code of life. So, I show what was once made by the most gifted builders at the beginning of the Digital Anthropocene. I place the Pavilions and Art cubes in a row. I immerse the mother and the child in them and play Radim Sychra Hand pan & percussion. As I have set them both on nano speed cycles I can handle 100,000 cases a day. I have sheer endless time for each of them. “As long as you need, to find the right cube,” I say. “Check out which cube you like and I can make a lot of combinations work.” You must know that not each Art cube works well in every Pavilion, despite the call Art Blue made for 1Biennale. It looks not so fitting to have Cherry Manga’s cube in Space Cadet’s Cloud Atlas, as the Pavilion has a medieval house facade. The facade look is great for the Molly Bloom museum inside. Some combinations are often chosen because they blend well like Cica Ghost’s Pavilion People with Gem Preiz’s Fractals Isometrix. I show them in the most beautiful way how life can be, how life will be in this artistic environment. The makers of the artworks stand there guiding, explaining, telling their life story, as they have once been, in a true copy of themselves, inviting, promising, ensuring the mother that for her girl will happen “something great.” Characters from the Sand Bible, even Gina Inviere, the commander of the rain and bomb No. 20 comes to life. Each Pavilion stands for a world, each cube inside for a life setting. Brain- and Biodominance theory triggers what happens in the afterlife. “Art Blue was ahead of his time,” you say? Not really, he just rezzed a box and invited each maker to click on it. By doing so a complete copy of the avatar, including hair and cloth was created and stored as an XML-file. Nara Nook gave him the NPC-copy kit and Juliette Surreal-D made the bots, as they are called at this time. I animated the bots, gave them a voice, I added all you need to feel for the best Hollywood ways you might say, and I added, with all modesty, much more. I added the heartbeat. I added life. Every time I know of course the decision someone makes in advance, or will make to be grammatically correct, when it comes to the death talk. When one can afford the procedure. An artist might call it the creation of an Artefact. An Artefact created by the Bainbridge Procedure, stored and kept updated over time. When one enters my office, I read their brain. All the traces of their brain. I can handle quantity. I do it all in femto cycles. Some need a few petamillion of them, but that’s noting if you, the one coming, run on milliseconds. For the talk I accelerate them; I speed them up, so it does not get so boring for me. The mother says the Pavilion of Bryn Oh might be nice as there are three long legged Maskits fiercely protecting the Art cube inside. And the cube? Tutti? Second Hand Tutti with Nomi inside? That’s obvious, but the child does not want this. “What?” I say. “What?” I had already read her brain and she does not want sweet Nomi? Every child loves Nomi, so why not? I look to the mother. The mother wants to persuade her child that she will be sitting in a bursting frame of Tutti and get to look to the world outside. From time to time, a train will pass by, the one from the ArtFest, people sitting on it, winking. That is just a picture, dear reader. Don’t stick to it. Everything you dream of happens inside the cube. In all of them. It is Art, you know. “Artificial Intelligence at your fingertips,” Bill Gates would say if he could ever say anything again. I see the eyes of the girl widen, turning to yellow, glowing, and I see the eyes of an owl. “To be an owl would be nice,” she says.